price (prīs) noun – The amount as of money or goods, asked for or given in exchange for something else. paradox (păr′ə-dŏks′) noun – A statement that seems to contradict itself but may nonetheless be true. 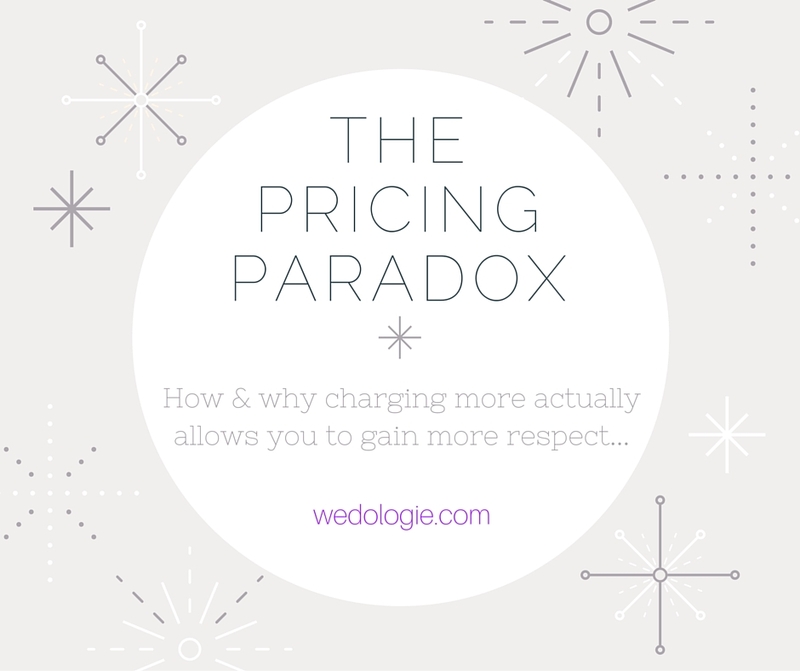 Pricing has been and always will be the most challenging thing for wedding professionals or any business owner. Charge too little and you resent the work, charge too much and put future bookings at risk. When I started out in wedding photography, I was SO bad, I mean, really terrible. I didn’t feel like it was right to charge much of anything to my first victims, er, clients. They were taking a gamble on me, no matter what I charged. I knew I couldn’t do it for free though (I had at least a little business sense back then), so I charged just enough to cover my expenses, which was basically film & processing (yes I am old). Once I got a few weddings under my belt, and my client had the right kind of tears over my work, I raised my prices slowly and steadily to match what I felt I was worth. Over time, the referrals were rolling in and I was consistently booking jobs, in fact, I was booking nearly every client I met. I knew it was time to really raise my prices, not just a little, but to put myself in the same range as my competition. I was gaining confidence, even getting published. I started to feel like “yea, I can really do this” – but I still had some clients that were treating me like the “hired hand” – making unrealistic demands, not considering my input, basically telling me how to do my job. Sometimes it wasn’t the clients themselves, it was their parents – I got a lot of “I wrote the check, you do as I say” lectures (it also probably factored in that I started out fairly young in this business, and looked even younger than I was. This definitely is not an issue any more!). Suddenly when I booked an engagement session, the clients were asking how much time I could give them (some previous clients made demands and asked for extras). They were asking me for referrals on other professionals I knew and trusted. They were asking me what I wanted to eat at the reception – like real, warm food! What is that magic price point? Just kidding – you have to find your own through research and the sadly, trial and error. You will make mistakes, you will be underpaid, you might even be overpaid (not possible, right? ), but in time you will see a shift in the way your clients respond to you. There are exceptions to every rule, but I can tell you my last 7 years in wedding photography were much more enjoyable than the first 5-6. Trust me, if you are starting out, no matter what your wedding profession, IT WILL GET EASIER. Isn’t it amazing how money changes everything?